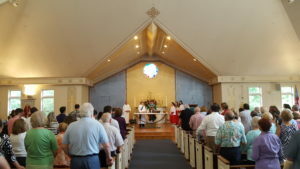 As a growing Episcopal parish in Severna Park, MD, we try to do what churches everywhere do. We worship God with all the joy and reverence we can gather; seek deeper faith in Jesus Christ; serve Christ in others, and welcome all who come through our doors. 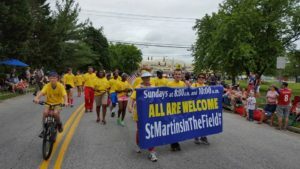 St. Martin’s-in-the-Field is part of the Episcopal Diocese of Maryland, affiliated with the Episcopal Church of the United States of America and the Anglican Communion of churches throughout the world. We are blessed to be situated in the heart of Anne Arundel County, between Baltimore, Annapolis, and Washington, DC. Since our inception, worship has been at the heart of our life together as a congregation. We seek to share Christ’s love and life in the world. Good music from our Schantz 26-rank pipe organ enlivens our 10 a.m. service. Sermons focus on scripture and theology as they intersect with our lives; the children participate in the Children’s Chapel at 10 a.m., opening the Word of God to them in story and activities as befit their age levels. We invite you to join us! Come to a service, allow us to know you. In the process we hope that you will be open to the possibility that God loves you wildly and creates you for God’s own purpose…one you might even discover as you journey with us!